In the interview as well as the book itself, she discusses her career path since graduating from Webster, and how she handles challenges such as a diagnosis of bipolar disorder. The article was picked up by the San Francisco Chronicle and other outlets around the U.S., as well as read on radio programs. Lewis graduated from the theater program in 1979 in Webster’s Conservatory of Theater Arts. 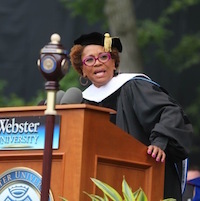 In 2015 she was the commencement speaker, also receiving an honorary doctor of humane letters degree. Devin Guajardo and Jazmon Garrett, two undergraduate students studying at the Gateway campus in downtown St. Louis, were featured by local media for their role as police officers working the beat to build community cohesion in St. Louis and deter juvenile crime in neighborhoods around Cherokee Street. It's part of a different approach to build rapport and familiarity with business owners and citizens in the area. 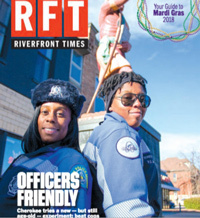 Guajardo and Garrett were on the cover of the Riverfront Times and also interviewed by CBS affiliate KMOV Channel 4 news. They met on their first day in the academy, are partners on the force, and classmates at Webster. Hayes was part of the "Race and Blues" panel. 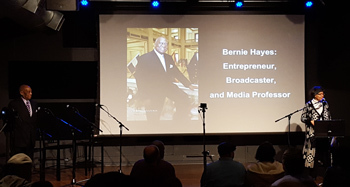 Two adjunct faculty members were part of KDHX’s live panel discussion of "Race and the Blues" as part of the station's "Black History Month series. Bernie Hayes, faculty member in the School of Communications, was part of a panel moderated by Rosalind Norman, faculty member in the George Herbert Walker School of Business & Technology. Video is available on KDHX's Facebook page here.